Since 2006, ComFor organizes annual academic conferences on various topics within the field of comics research. 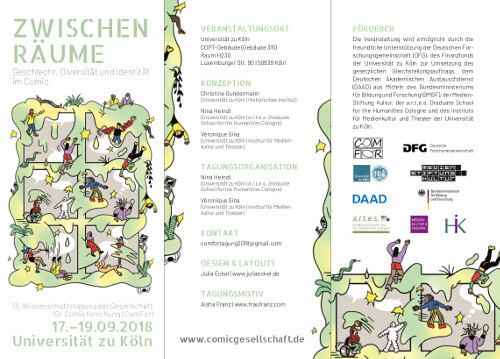 From September 17th to 19th 2018 the 13th Annual Conference of the German Society for Comics Studies (ComFor) took place at the University of Cologne. Under the main theme “Spaces Between – Gender, Diversity and Identity in Comics” the conference schedule – planned and organized by Véronique Sina and Nina Heindl – offered a wide range of interesting insights into state-of-the-art research on the nexus between the medium of comics and categories of difference and identity such as gender, dis/ability, age, and ethnicity. Participants who already arrived on Sunday (the day before the official start of the conference) had the opportunity to become familiar with the city of Cologne. In the afternoon, the cultural program started with a guided tour through the exhibition “Avengers Assemble” held at the Cöln Comic Haus. With highly entertaining host(s) and a lot of interesting details, the visit of the exhibition was a perfect start for the conference. Afterwards, the group took a stroll along the Rhine in warm and shiny weather. With a boat-trip along the picturesque panorama of the most beautiful part of Cologne, the pre-program ended and gave the participants the opportunity to enjoy the rest of the evening in the historic center of Cologne. At the official beginning of the conference on Monday, the conveners Véronique Sina and Nina Heindl, as well as Manuela Günter (Vice-Rector for Gender Equality and Diversity of the University of Cologne), and Stephan Packard (President of the German Society for Comics Studies) welcomed all speakers and guests. 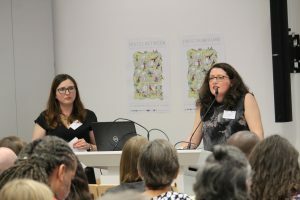 They stressed that it is their great pleasure to open a conference that not only focuses entirely on gender, diversity, and identity in comics, but also presents a majority of female speakers as well as an all-female organizational team – a premiere for the German Society for Comics Studies. In less than two and a half months, ComFor’s Annual Conference 2018 will take place at the University of Cologne on the topic “Spaces Between – Gender, Diversity and Identity in Comics”. At the same time one can visit the exhibition “SuperQueeroes. Unsere LGBTI*-Comic-Held_innen”, which was designed in 2016 by the Schwules Museum Berlin and shown with great success. 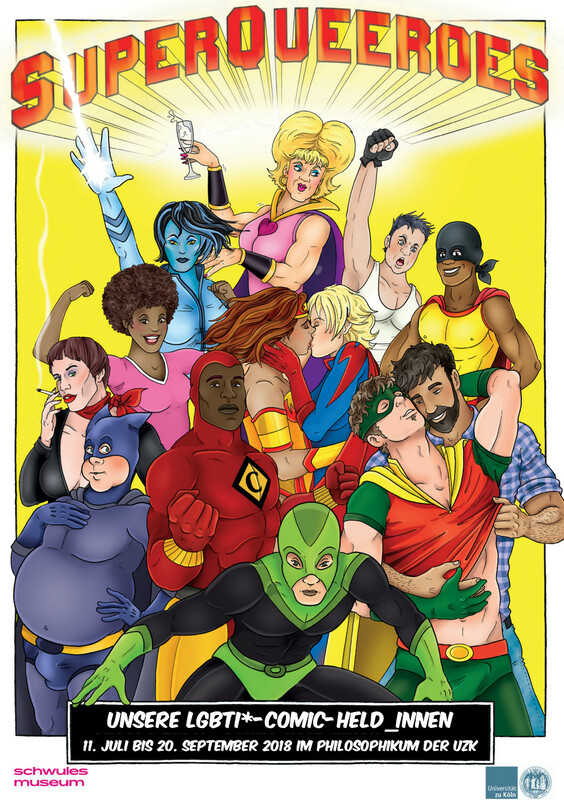 For the first time, queer comic heroes of various kinds were thematized in the German museum world. As part of the ComFor annual conference, the exhibition was brought to Cologne under the organization of Christine Gundermann and reworked for the university by students as part of a seminar. The exhibition can be visited from 11 July to September 20 in the foyer of the Philosophikum of the University of Cologne. 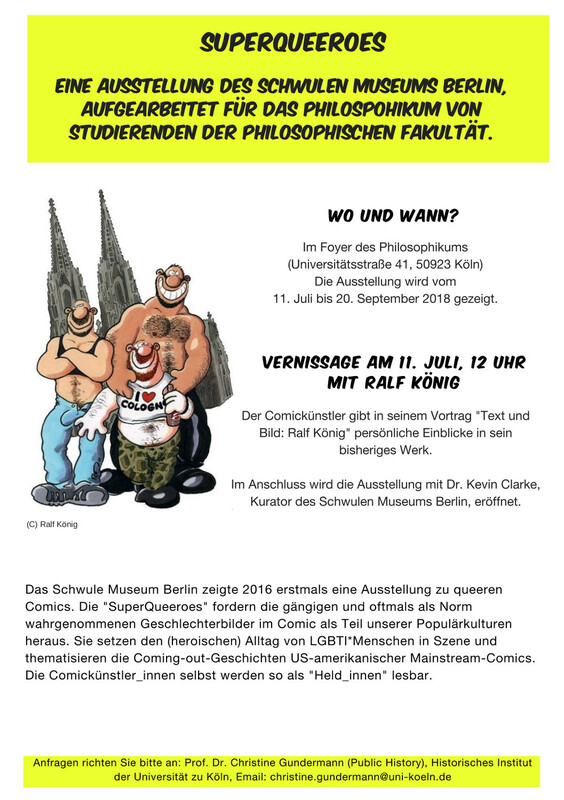 Vernissage is on the 11th of July from 12 o’clock, opening with a talk by and about comic artist Ralf König . Subsequently, the exhibition will be opened by Dr. Kevin Clarke, curator of the Schwules Museum Berlin. Bettina Begner, Stephan Böhm, Jan Harms, Yasmin Neuhaus, Anja Pflugfelder, Michaele Pollich, Jacqueline Rehse, Lukas Respondek, Elea Thieser, Alina Valjent, Elsa Weiland, Lies Weimer, and Philin Zwirner. Please transfer the conference fee to our account (see below) no later than September 3rd 2018 (received payment!). The conference is being sponsored by: DFG, German Research Foundation | Finanzfonds der Universität zu Köln zur Umsetzung des gesetzlichen Gleichstellungsauftrags | | the equal rights commissioner of the Faculty of Arts and Humanities at the University of Cologne | the German Academic Exchange Service (DAAD) funded by the Federal Ministry of Education and Research (BMBF) | MedienStiftung Kultur | a.r.t.e.s. Graduate School for the Humanities Cologne | Department of Media Culture and Theatre, University of Cologne . For decades, comics have been perceived as a mass phenomenon situated in popular culture, which manifests, establishes and perpetuates stereotypical (gender) representations. Hence, the image of a particularly helpless, passive, but all the more attractive female victim is at home in the repertoire of the medium no less than the representation of a radiant, muscular, white, heterosexual hero, whose first duty consists of protecting the world and its inhabitants from catastrophe. In this sense, comics might seem alike to other forms of mass media in the age of mechanical reproduction and their tendency towards generalisations and clichés. 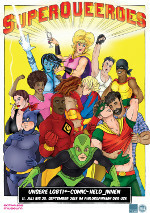 From a historical perspective, reactions to the worldwide anti-comics campaigns of the 1950s, including self-censorship among numerous comic book publishers, also exemplarily point to heteronormative and xenophobic tendencies within mass media comics culture, which was in turn long reflected in the demographics of its readership. However, as a popular and oftentimes marginalised medium, comics never completely became one with this role of a (reactionary) stabilising force. Rather, comics are imbued with a socio-political dimension that has always encouraged comics artists to use the spaces between in a creative way, and to question and subvert (social) norms. Comics are both visual and sequential art: they constitute a visual medium that is defined by the sequence of its static images as well as by the spaces between the panels. Hence, the succession of sequential images in comics is by no means seamless. Rather, the conglomeration of (blank) spaces interconnects and separates them at the same time. These ‚spaces between’ might be used or construed as a reference to a realm of the ‚unshown’, wherein notions of a final, self-contained truth are renounced and alternative worldviews that challenge the social status quo are enhanced. 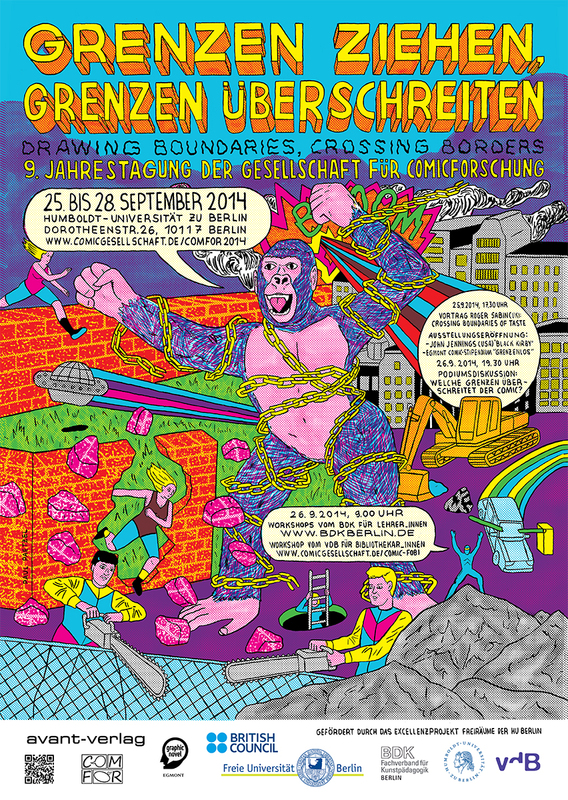 At the same time, the theme of the planned conference on ‚spaces between’ refers to the hybridity and ambiguity of the art form that combines picture and text: As an ‘inter-medium’, comics constitute a transgressive form which resists common classifications and mechanisms of exclusion based on hierarchical and hegemonic structures. In this respect, comics have the potential to destabilise and blur binary oppositions such as subject/object, nature/culture, man/woman, authentic/artificial, good/bad, normal/abnormal or black/white that are usually perceived as ‘natural’ and ‘given’. In certain circumstances, the medium thus has the potential to break up rigid dichotomies, and to open up spaces for the representation of ‘shades between’ – of fractions, differences and diversity. The 13th annual conference of the German Society for Comics Studies will examine this productive potential of comics by uncovering and analysing different forms of the ‘spaces between’ within the art form itself, but also within its production and its audience. The internationally and inderdisciplinarily assembled talks will focus on the question how gender, identity and diversity are represented and negotiated in sequential art. The conference topic Spaces Between – Gender, Diversity and Identity in Comics will draw our attention to the nexus between the medium of comics and categories of difference and identity such as gender, dis/ability, age, and ethnicity, in order to open and deepen an interdisciplinary conversation between comics studies and intersectional identity studies within the international comics studies community. 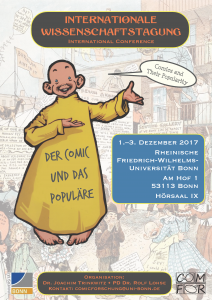 In this respect, the 13th annual conference of the German Society for Comics Studies will not only contribute to the disclosure of exclusions, power structures and (hetero-)normative allocations in comics, but will also critically analyse their socio-political and communicative forms of (re-)production. 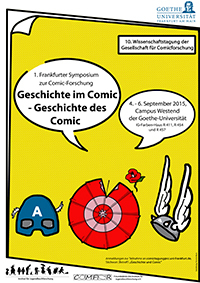 Beyond the discussion of each year’s special topic, the German Society for Comics Studies aims to further co-operation and dialogue in all areas of comics research. The 13th Annual Conference in Cologne will therefore continue an open workshop format that allows researchers to present and gather feedback on on-going projects within comics studies in all stages of development, and without any thematic restrictions – not limited to the conference topic. The invitation stands for colleagues in all phases of academic careers to discuss any projects on which they are currently working. Contributions to the conference will be accepted in English or German and should not exceed 20 minutes. The presentations in the open workshop are limited to 15 minutes. We plan to publish selected contributions in an edited volume. 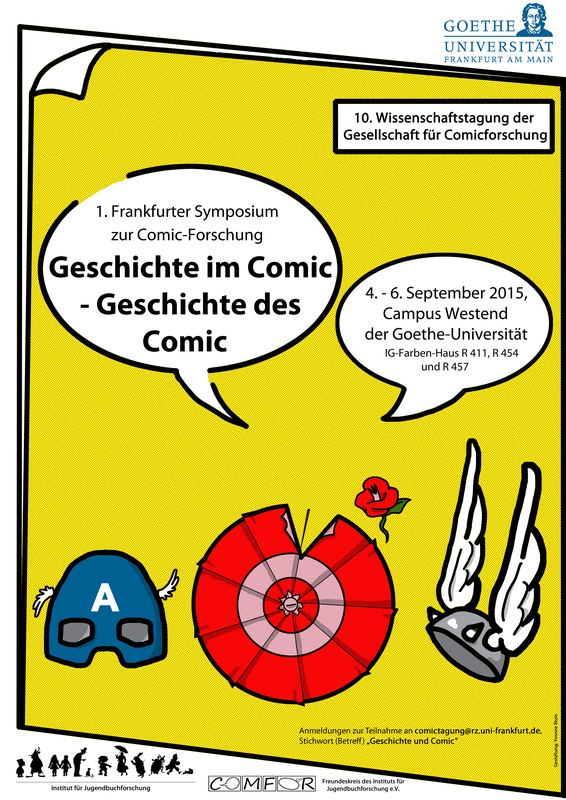 Participants are not required to be members of the German Society for Comics Studies. Contributions from non-members welcome! The University of Bonn warmly invites to the 12th annual research conference of the German Society for Comics Studies (ComFor) from December 1 to 3, 2017: “Comics and their Popularity”. It is organized by Joachim Trinkwitz and Rolf Lohse. PROGRAM: 10th COMFOR-Annual Conference in Frankfurt/M. As the title indicates, the contributions and discussions of the conference will focus on comics and graphic literature with a double perspective: One field of interest will consist of the historical topics and subjects, ranging from antiquity to contemporary history, that are depicted in works of sequential art from all over the world and attract the attention of a broad readership. Contributing considerably to an international archive of cultural memory, comics play an important role in academic research as both historical source material and as depictions and interpretations of historical events. This provides a fertile ground for interdisciplinary research that combines approaches from academic disciplines such as literature, art, media, and cultural studies and history in particular. Another field of interest – closely linked to and in correspondence with the aspects mentioned above – consists of the historicisation of the phenomenon ‘comic’, its contemporary varieties and its readership(s) as well as the analysis of its international developments. Focusing on history and the historical in picture stories, it is adequate and relevant to ask about the lines of tradition of the medium and their preconditions: not least since the debates on new (or seemingly new) trends such as manga and graphic novel, seriality, media culture, the relation of comics and picture books, comics in traditional and modern media, etc. raise questions on the nature of graphic literature. Ob zwischen West und Ost, Ober-, Mittel- und Unterschicht, Mann und Frau, oder E- und U-Kunst, Realität und Fiktion: Ständig werden von uns Grenzen gezogen, überschritten und neu gezogen. Für Jurij M. Lotman sind dies fundamentale Akte einer jeden Kultur. Der Begriff der Grenze ist stets ambivalent, trennt und verbindet sie doch zugleich. Auch der Comic setzt und überschreitet Grenzen, inhaltlich wie formal. So verwischt er etwa prinzipiell die Unterschiede zwischen Schrift und Bild. Comics werden längst global vermarktet während sie sich mit nationalen Grenzen ebenso häufig wie mit jenen im Bereich class, race und gender beschäftigen. Und sie lassen in vielen ihrer Figuren Mensch und Tier ununterscheidbar erscheinen. Die 9. Tagung der Gesellschaft für Comicforschung möchte diese und weitere Phänomene rund um das Thema „Grenze“ näher untersuchen. 14:00-17:00 Mitgliederversammlung der Gesellschaft für Comicforschung (ComFor). 17:30-18:00 Begrüßung und Grußworte durch das Präsidium, die ComFor und die Organisator_innen. 18:00-19:30 Abendvortrag: „Crossing Boundaries of Taste in the 19th Century: Satire versus Slapstick; Pictures versus Text; and What It Might Be ‘Acceptable’ for the Working Class to Enjoy“ (Roger Sabin, UK). 19:40-20:30 Ausstellungspräsentation: „BLACK KIRBY: In Search of…The Mother Boxx Connection“ (John Jennings, USA).